The first auction, M.U.S.C.L.E. Vintage 1985 Mail Away Poster VHTF Rare Mattel, highlights the best way to sell a poster on eBay. Because poster condition varies so greatly, in addition to how people “grade” the quality, setting a “fair” asking price is very, very difficult. That’s why setting a low opening bid for posters is imperative. This poster specifically seems to be in acceptable condition – not terrible, but certainly not mint. The low opening bid will certainly bring in bids. The only potential downside is the shipping price. It seems a bit high. However, hopefully that higher cost will insure the buyer gets the poster safely and quickly. The second auction, AFA GRADED M.U.S.C.L.E. MEN VINTAGE LOT HIGHEST GRADED 28 PACK RING 4 PACK, highlights a different kind of M.U.S.C.L.E. auction – the opening bid that insures zero bids from potential buyers. Getting M.U.S.C.L.E. items graded is a completely separate subject. The majority of M.U.S.C.L.E. collectors don’t care about it, but both sides have valid arguments. The problem with this APA-grade M.U.S.C.L.E. auction is simply the value placed on the grading. Even if these three items were 1985-fresh-from-the-case mint the top price from the lot would probably be, at best, around $200. Fans of AFA-grading would then be quick to point out, “Well, it cost me ‘X-amount’ to get those things graded!” So what? If a collector buys into the idea of grading items, then the premium should rest solely with the grading – not the cost of grading. The $29 for shipping rubs salt into the wound the $449 opening bid creates. This auction will not sell. This auction would be incredibly interesting to watch if the opening bid was $0.99. It would certainly attract attention, but would it bring in truly premium bids? Probably not. The third auction, M.U.S.C.L.E Men Kinkeshi Cosmix Exogini #002 Terri-Bull (Class B) RARE, and the fourth auction, Class A Muscle Figure Purple #2 Terribull M.U.S.C.L.E Gpk OMFG Mint, might be the perfect example for uninformed sellers. 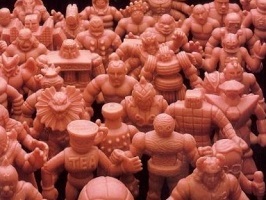 The third auction, M.U.S.C.L.E Men Kinkeshi Cosmix Exogini #002 Terri-Bull (Class B) RARE, is essentially a joke. The Class system was created (over five years ago) as an aid for collectors. Over those five years it has largely served as a positive tool. Occasionally a seller attempts to simply equate the Class grade to a price tag. In a handful of instances that thinking is correct (e.g., Purple #153, Salmon #107, etc. ), but for the most part that thinking is completely incorrect. A Dark Blue #2 might be a little less common, but it does not warrant a $25 opening bid. The fourth auction, Class A Muscle Figure Purple #2 Terribull M.U.S.C.L.E Gpk OMFG Mint, shows that M.U.S.C.L.E. collectors will always pay a premium for truly desirable items. No hype is needed. A high starting bid is not needed. All that is truly need? A decent picture and fair shipping. The thing that makes the fourth auction even better is that it is being sold by a long-time, positive contributor to the M.U.S.C.L.E. community. More and more the silly, over-priced single figure auctions seem to be filling up eBay. The last two auctions provide a respite from the single-figure onslaught. They also provide hope that, regardless of a few stupid auctions, M.U.S.C.L.E. collecting is an easy and fun hobby. This entry was posted on Thursday, September 19th, 2013 and is filed under Auction Watch, UofM News. You can follow any responses to this entry through RSS 2.0. You can skip to the end and leave a response. Pinging is currently not allowed. Hi Guys, the poster shown in lot #144 is mine and I have a job lot that I am selling individually as they all have some miner damage in the bottom left corner too different extents. The postage is high but this is due to a poster tube being used along with tracking. Feel free to come and have a look, my Ebay user name is wolforrest.